Howdy friends and neighbors, I bought a Firepower Silencer 600 power supply. It's a little longer than most PSU's, so I need to find a Mid Tower case that it will properly fit into the top of. I believe that the Firepower Silencer 600 is actually made by PC Power & Cooling. They built da kine power supplies in days of olde. I'd love to avoid hacking and hewing on a case to shoehorn this power supply into it. Technically, that's an EPS12v power supply. It's 160 mm deep, rather than the 140 mm defined by the ATX12v specification. They are nowadays referred to as 'extended ATX' I think. You should be good with any server case, or any case that is 'Extended ATX' or 'eATX' compatible. 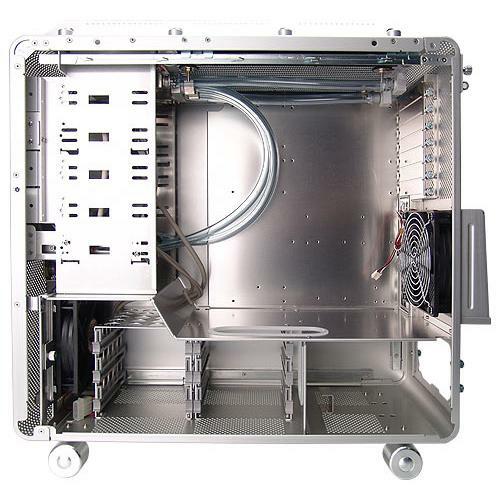 It's been a while since I shopped for a new case though, so it would be good to verify with the reseller that you can mount a PSU that is 160 mm long in the case (i.e. a PSU larger than the standard ATX). You are da man, Gizmo! Thank you very much! Oh, crud. EATX cases seems to mean "PSU mounted on the bottom rear of the case." "Why do you want to top mount it?" Because the PSU's heat goes right out of the top of the case, zip, just like that with a top mounted PSU. Argh, looks like I messed up. EATX cases seem to feature at least 7 fans and as many as 11. So bye bye to quiet, which this Lenovo does very well. I don't want another wind tunnel machine. The last box I built measured 70db at the top rear. I had to be careful about heat, I was overclocking it. That booger was LOUD. Sorry to be APITA, should have looked before I leaped. I was going to say, but you've already noticed, eATX cases will tend to have a lot of fans because they are generally built for server applications. However, if you put a fan controller on it, you should be able to manage the noise level quite efficiently. It's not nearly as fancy, but gives you 5 30w channels. That would allow you to handle even something like a tornado fan on the controller, and it's only $25. As for top vs. bottom, as long as you have another fan in addition to the PSU (and it is up high), I wouldn't worry about it. Turn the PSU fan around so that it pulls air from the case and exhausts to the outside (in fact, it MAY already be configured that way; I've seen it both ways) and you should actually be in a pretty good state for ventilation. We used to have some lively debates about positive vs. negative pressure inside the case, and I've gradually come around to the idea of positive pressure, mostly to kill dust-bunnies in the case. This means you want more intake than exhaust, though you don't need a huge difference in volume. Then put some air filters on the intakes. Last edited by Gizmo; 27th September, 2015 at 06:21 AM. Thank you very much for your help, Gizmo! I don't suppose that there are ATX Mid Towers that don't have a "stop" built into the top of them that interfere with a 160mm long power supply? Sorry, that's a pretty esoteric question, no prob if you don't know. I put a PC Power & Cooling Silencer PSU into a Antec Sonata case ("The Power of Silence") some years ago. Of course it was a roaring OCer's box that had "The Power of Noise of a NASA Wind Tunnel." Positive internal pressure is a must, Seattle is a very dusty city. We're nearly surrounded by water, so it's a mystery to me. Thanks a bunch for suggesting the NZXT Fan Controllers, a great idea! I don't suppose that there are ATX Mid Towers that don't have a "stop" built into the top of them that interfere with a 160mm long power supply? Just beat it into submission. LOL. Seriously, I'd probably either bend the tab out of the way (if it's a simple bit of sheet metal) or break/dremel it off if it's actually a welded piece. My current PSU is too big for my case, it just sticks out 2", but doesn't cause a problem for me. Thanks Gizmo, that's a good suggestion. For some reason I'm seeing a "bulge" that won't easily be defeated. I hope you're right! Shazam, danrok! Two whole inches? Are you running a Server Extra, Extra Long PSU From Hell in that machine? Thank you for the suggestion, maybe 20mm of power supply simply hanging out the back wouldn't be too big a transgression. Case is much the same as this one, you can see the problem. If it was a cheap case I would just scrap it. Thank you for the response. Are those wheels on the bottom of the illustrated case? No wonder you didn't toss it out. Certainly looks like a dead stop to the length of a PSU, and how. How did you firmly mount your over long power supply? It looks like the PSU mounting screw spots had to be cut out of the way. Thanks for your help, guys! Looks like the standard place for a PSU has become the bottom rear of ATX cases as well. Kinda makes sense, installing them into the top rear of the case made the case top heavy, that's for sure. So, the PSU's fan is now supposed to exhaust out of the bottom of the case. Is this a true story? AKAIK, the idea is to have the PSU fan pull air from inside the case and exhaust out the back; at least, that's the way all the systems I've built have worked. Exhausting out the bottom seems....not a good plan. It's been so long since I installed a power supply that I remember them exhausting out of the top of the PSU, I think, duuh. It'd be good to be wrong about that in the modren age. Thank you for the reply, Gizmo. Last edited by cloasters; 9th October, 2015 at 04:16 AM. Most older PSUs had a fan on the back, blowing out warm air. Newer quality units tend to have a bigger fan on the top, drawing air in to the PSU. The air exits out of the back all the same. Of course, some have a fan on top and at the back. Well I'll be.. wth did Yosemite Sam use to say? I've been away from machine assembly for far too long, thank you very much for your assistance danrok plus Gizmo!